The Drogemuller’s Paracombe vineyard is nestled on a plateau 425 metres above sea level. Soil is lean with ironstone, buckshot gravel and quartz, an interesting remnant from an ancient riverbed. These characters along with minimal irrigation contribute a strong influence in wine style and flavour. The fruits of the efforts in the vineyard translate into some of the most exciting wines that Adelaide Hills has on offer. The vineyard has an easterly aspect making the most of the morning sun. Grapes ripen slowly and gently during the warm, sunny days and cool nights of late summer, early autumn. Paracombe's winter is cold and wet. Warm, dry clothing is a must for pruning, which is all done by hand. Bud thinning in early spring creates optimum bunch position and low yields. Vine canopies are lifted to vertical shoot position promoting air flow letting sunlight in to the fruit zone reducing disease pressures and granting ripe flavours. Vines on the Paracombe estate are meticulously cared for, taking advantage of the morning sun for optimum fruit ripening. Paul and Kathy make the most of their experiences and background at farming in the Adelaide Hills. Amongst some of their friends are some of the region's finest growers. Paul and Kathy are well positioned to collate the best parcels of local grapes, which are exactingly vinified into the most vibrant examples of Adelaide Hills wines. 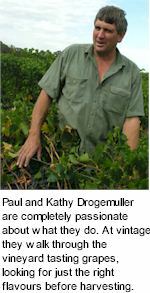 Simply said, Paul and Kathy Drogemuller are completely passionate about what they do. At vintage they walk through the vineyard tasting grapes, looking for the right flavours before harvest. Grapes are selectively harvested to gain the best flavour and quality possible. Some fruit is sourced from a small selection of specialist growers with similar soil types and carefully managed vineyards. As the label design for Paracombe Premium Wines is unique, so is the story behind the grape on the piece of granite. When the brand in 1992, Paul and Kathy were looking for a design which was stylish, striking and memorable. Adelaide designer Gavin Klose of DO-DA Design was just starting out, Paracombe was one of his first clients. The single grape portrays the highest level of quality and care put into vineyard management. Hand tendered vines are in turn backed up by specialised care during winemaking. The piece of granite on which the grape sits has been shaped to represent the same shape of the Paracombe plateau taken from a contour map. Granite was chosen, as the colour and feel of granite is cool, this signifies Paracombe’s cool climate which is ideal for producing elegant and stylish wines. University of South Australia design lecturer Lynda Kay chose Paracombe as one of her favourite labels, here is what she had to say, “I like the combination of white space, asymmetric layout and unusual photography — reminiscent of an egg on toast. I think this label challenges some of the more classic labels. It is also interesting to look at previous vintages and see how the brand has developed in the past few years — reflective of the growth of the business!" Paracombe consider that their label reflects the essence of quality in clear, elegant style. The design makes a positive impact and stands out from the crowd whether on the restaurant table or on the retail store shelf in Adelaide, Sydney or New York.